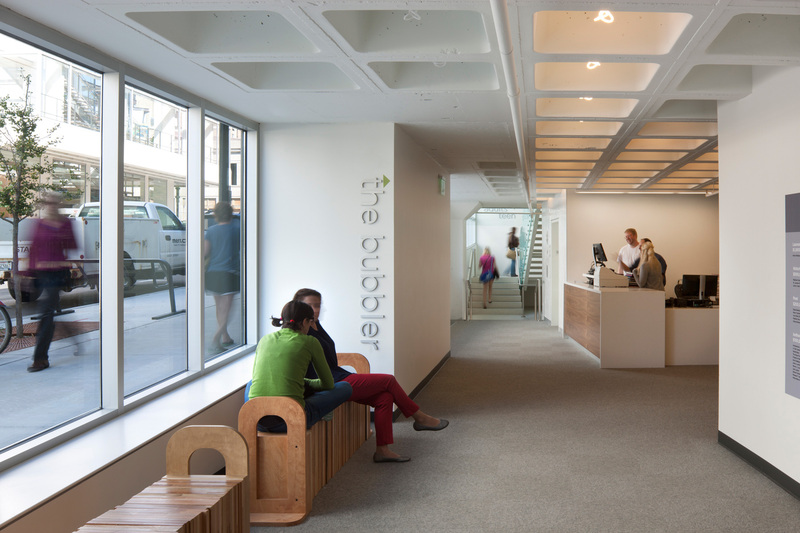 Clients often ask design professionals to create spaces for collaboration. With today’s technology, people can collaborate anytime, anywhere and with anyone around the globe. 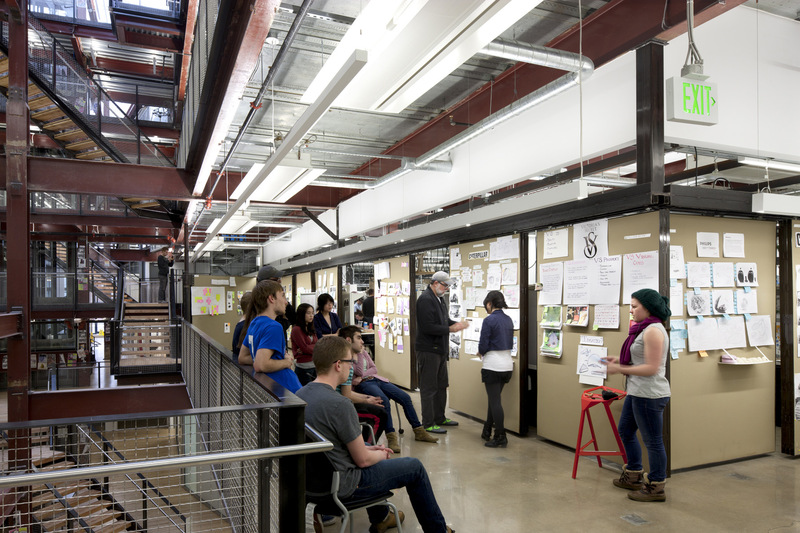 But sometimes they need to be face-to-face, and they need spaces that don’t merely allow collaboration to take place. They need spaces that elevate working collaboratively. For libraries, providing furniture that supports group work or adding a white board and monitor on the wall of a study room are good places to start. But collaborative space demands much more thought and planning to be successful. 1. The many reasons library users may wish to collaborate with someone. Libraries provide spaces in their communities for work, creation, learning, play and socializing. 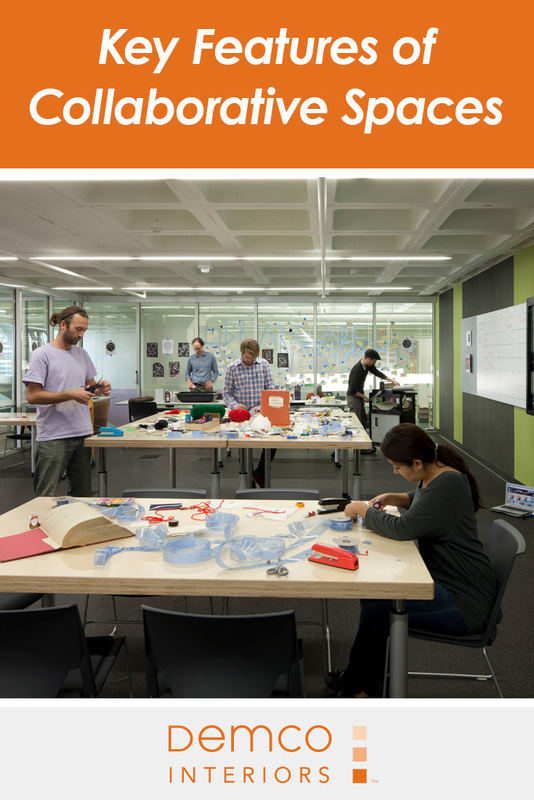 The collaboration space needs for play (such as developing a claymation) are quite different than those needed for education (such as meeting with research colleagues). There are nearly as many types of room needs as there are ways of collaborating. Each type of collaboration space may require a specific type of furniture and level of privacy, as well as different acoustics, lighting and technology (or no technology). 2. The library’s role as a partner in innovation for public, nonprofit and private market sectors. Thriving in the network economy requires the ability to collaborate, communicate, work in groups, solve problems creatively and think critically. Libraries provide not only the space, but also the research assistance and resources for a wide variety of customers to thrive, including co-working groups, nongovernmental organizations (NGO) and for-profit and nonprofit businesses. 3. The library’s role as both a direct and indirect partner in education. Educators from all levels are evolving their pedagogies, updating building facilities and adapting curricula to respond to the need to equip our society with knowledge economy skills. Hands-on and interactive learning has taken off in education and in libraries. All libraries, including public, special, academic, school and corporate, are indispensable partners in education due to the resources, services, spaces and experiences they provide. 4. More and more people use the library for long stays. The number of people using the library as an office, workshop or experimentation ground has increased exponentially. Be prepared to navigate longer stays and multiple competing demands on your collaborative spaces. Libraries generally can’t afford the square footage that would support a customized space for each possible activity type (nor is that necessary or even wise). Flat or declining budgets mean leveraging every square foot to its fullest. Yet libraries strive to be all things to all users and continually evolve as personal definitions of library relevance change. Because of this inevitable, ongoing evolution, designers have promoted flexibility as good library design practice. A storytime room in the morning might be an interactive play area in the afternoon. A static study table from last year might be a Wii station this year. What is often missing, however, is scalability of flexibility, from the building infrastructure scale to furniture scale and everything in between. Ideally, libraries should be able to adapt their interiors in both large and small ways, for large and small groups, and for short and long timeframes. 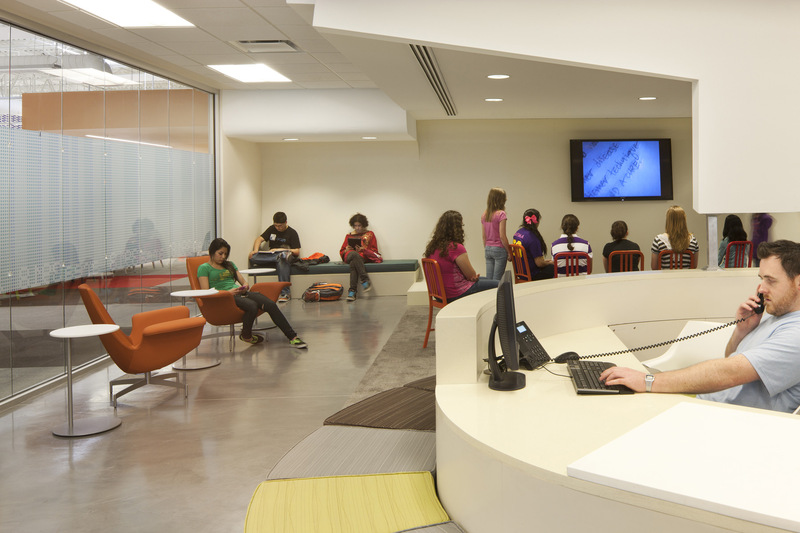 With today’s technology and product offerings, libraries can enable users to make a space their own. 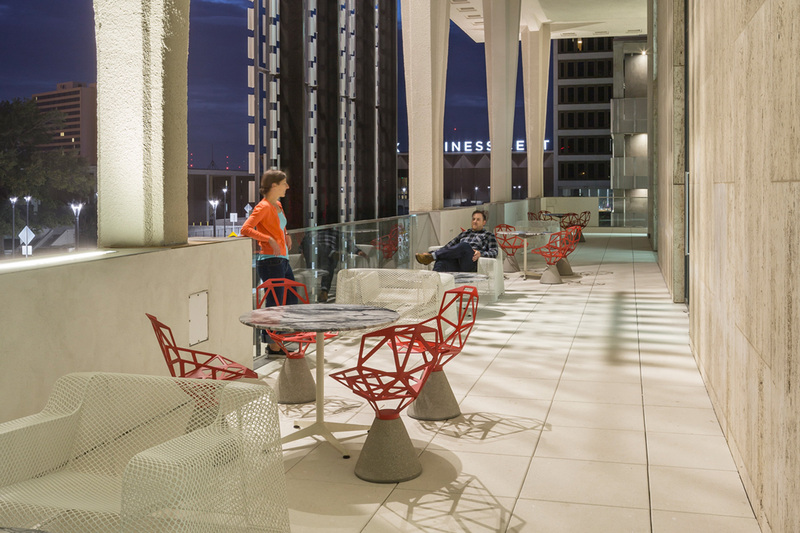 Spaces can be designed so that users can change the lighting, reconfigure the walls, add pin or marker boards, switch up the furniture layout, and even change access to power or the temperature of the space. Providing a range of adaptability is critical with collaborative spaces, as the nature of collaboration continues to evolve and the requirements are expanding over time. Library customers collaborate in a wide variety of ways, and new tools are constantly being developed and enhanced. For example, software packages that allow for seamless and intuitive collaboration and sharing of digital information from multiple inputs were an expensive novelty only a few years ago. This same software is now more economical and more prevalent. 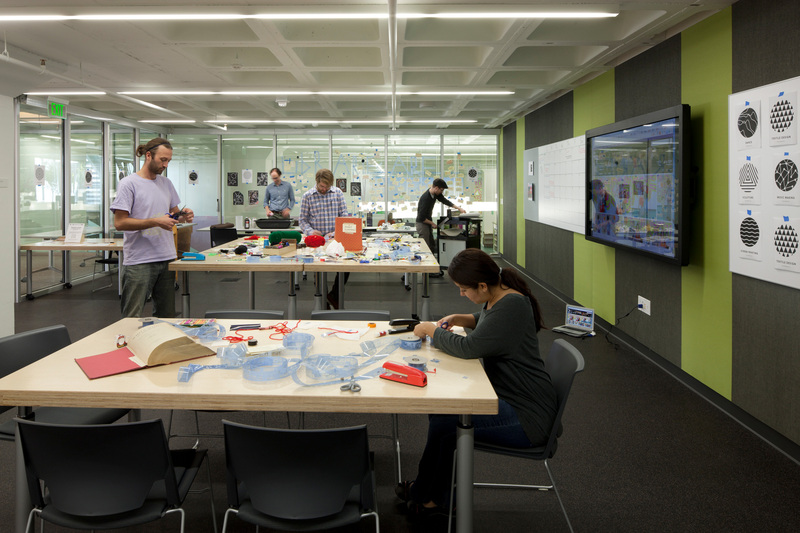 The more adaptable a library’s collaborative spaces are, the better able the library will be to accommodate these changes gracefully and economically. Spaces prepared to accept inevitable innovations in technology — infrastructural as well as informational — will ensure viability. To be equal contributors to a discussion, individual participants must have equitable access to the knowledge pool, as well as the ability to share their knowledge. Each person brings a unique point of view, experience and special knowledge to contribute. Effective collaboration requires that knowledge sharing occurs in a transparent and accessible way to the entire group. The nature of what we collaborate on is also evolving. Collaboration involves all the senses now, not merely sight and sound alone. Projects may require a place with not only space for the participants, but also the infrastructure and tools to move fluidly through various mediums in order to illustrate, share, research and debate ideas. Many simple methods exist to facilitate knowledge sharing, each with its own space implications. Simply talking to one another requires a room with acoustic privacy and perhaps the capacity to hold a phone or video conference. Pin and marker boards (digital or physical, localized or dispersed) are another simple way to facilitate knowledge sharing. Users can also use software to work-share and co-edit in real time while in the same room or scattered around the globe. These tools have become mainstays of culture, business and education. When libraries offer them, it ensures that people without regular access can learn about and use them. 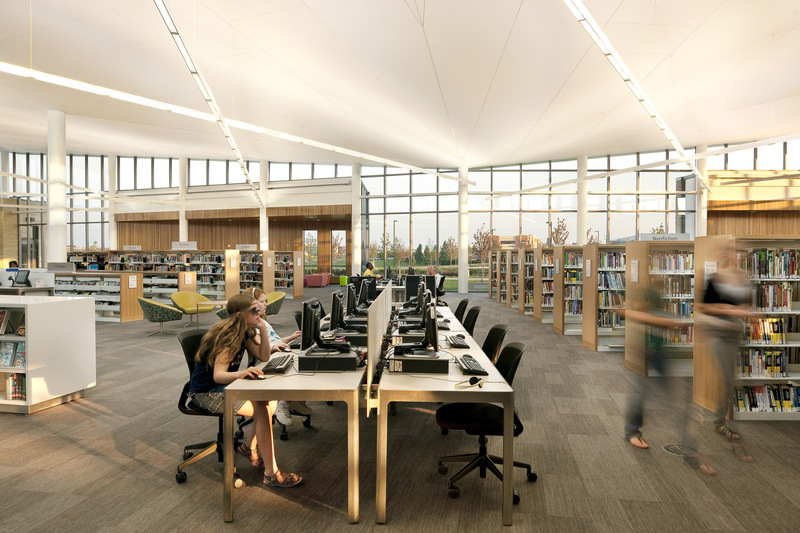 Your library provides essential workspace for your community. 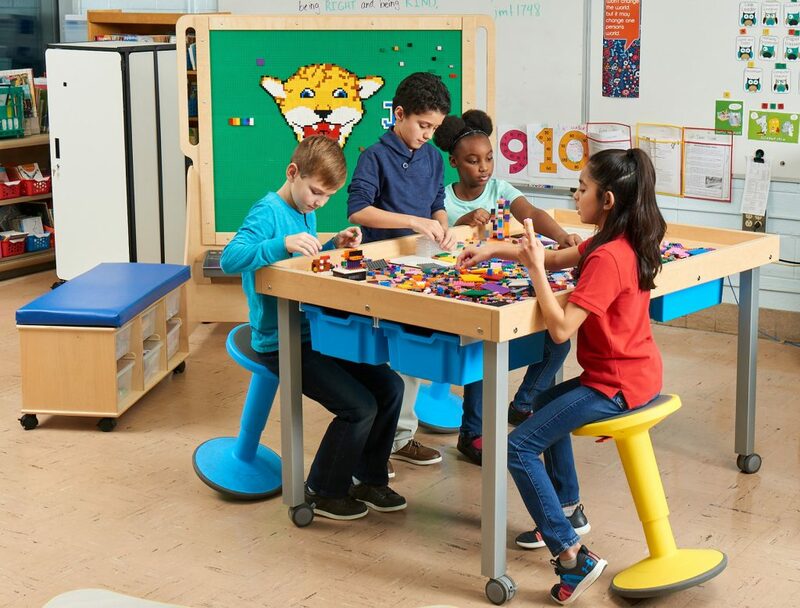 Take your library to the next level with the collaborative furniture and equipment your patrons need to succeed. Request a consultation to have a Demco interior services specialist help you maximize your space. Zoning the library is key because, while offering collaborative spaces is a necessity, they are just one of many types of spaces in a library. Variety and choice in experience are necessary, but attention to acoustics is also vital, as many people still come to the library for quiet and respite. 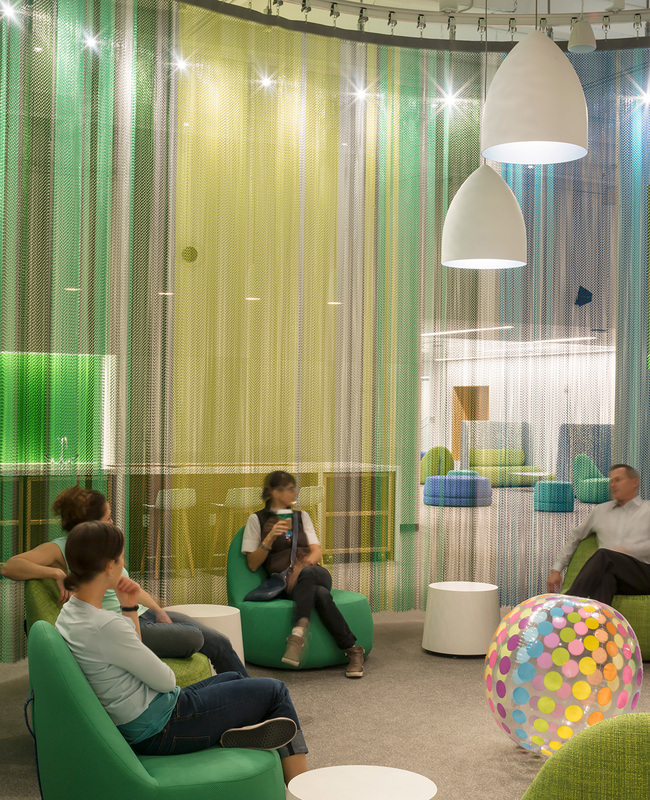 Acoustic conflicts can be avoided by strategically locating the library’s collaborative areas. Zone your library interior to separate active, noisy activities from quiet ones. 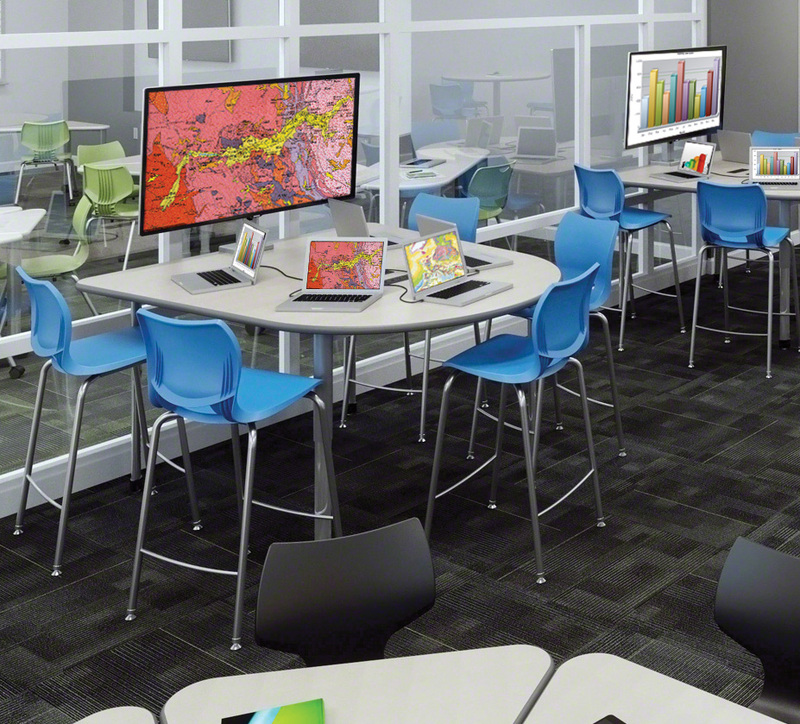 Consider human nature when planning the locations of collaborative spaces. For example, many people talk louder than usual when on a conference call, and makerspaces often generate excitement and boisterous sharing of experiences and ideas. Choosing finish materials for your collaborative areas that refract or absorb sound can help provide a buffer for quieter areas. Myriad technologies, furniture, accessories and options in a space can prove distracting. Our brains are wired to search for patterns to make sense of our visual worlds and can become fatigued and overwhelmed when they encounter too many things to process. Removing some of those distractions can help provide clarity and focus. Offer views to nature. Research shows that just 40 seconds of focus on nature resets our brains and clears the deck for innovation and “aha” moments. Use layering to pack more in while allowing for visual quiet when required. For example, use sliding panel or Murphy-bed-like hardware to conceal or reveal pin and marker boards and technology. Provide closets for storage of additional furniture or accessories. Design lighting to allow tiered customization to ambient, daylight and task lighting. Include window shades. Views outdoors increase productivity, but window shades screen out the outside world when inward focus is desired. Some of the best collaborations happen accidentally. The office water cooler conversation is an example. In addition to offering spaces intentionally designed for collaboration, you can also foster serendipitous collaborations. 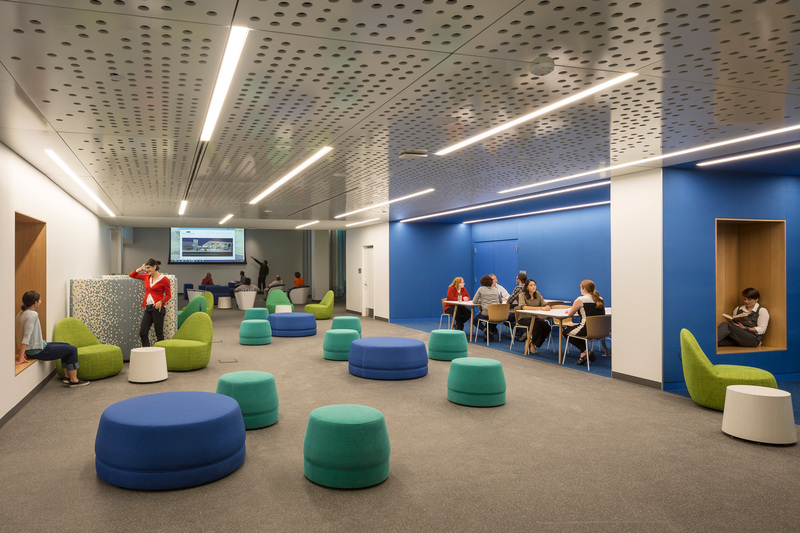 Invite these types of encounters by placing seating and tools in nearby niches for impromptu breakouts, and locate collaborative zones and spaces along heavily traveled paths to remind library users of your offerings. And don’t forget to make use of outdoor spaces. Nature and fresh air jump-starts creative thinking, often making collaboration more effective. Library customers seek services, resources and spaces, from solitary to highly collaborative, that support them in play, creation, study, work and socializing. 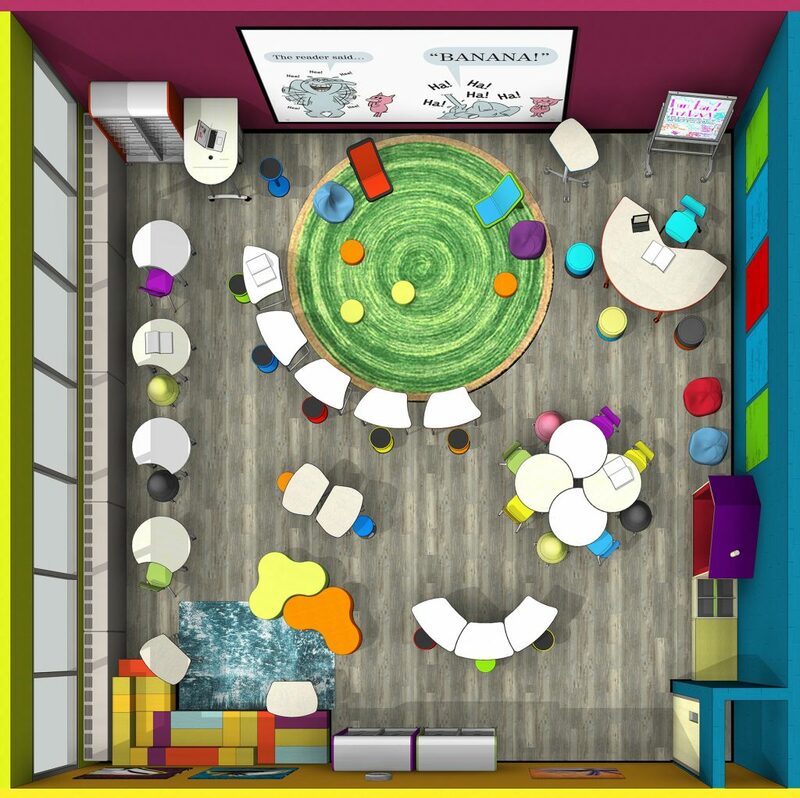 Libraries that move beyond a one-size-fits-all approach to collaborative spaces will find themselves in an improved position to support their users’ myriad needs and learning opportunities. Traci has been with MSR since 1996 and has 21 years of experience designing compelling learning spaces. As head of interiors and a principal with the firm, Traci uses an integrated design approach involving multiple disciplines. Her designs factor in users' experience, comfort as well as productivity and aesthetics. She holds a Bachelor of Fine Arts in Interior Design from the University of Wisconsin-Stout and is a regular guest lecturer there. Traci has made a name for herself as an inspiring designer and international speaker, presenting workshops and discussions about library design. She has presented at the ALA Annual Conference for the past 4 years and recently presented a talk entitled, “Reset: Transforming Mid 20th-Century Libraries to Meet 21st-Century Needs” at the IFLA Congress in Cape Town, South Africa. She has written articles for New Library World and Library Journal. Traci is currently chair of the ALA LLAMA/BES Architecture for Public Libraries Committee and also serves on the IFLA Library Buildings and Equipment Section Standing Committee.